The Onion never fails to amuse me. Hope you enjoy it, too, and that this cynical and fictional look at a hack doesn't hack you off. Click on the link above for the answer to this burning 45 year old question! You suppose this is one big diamond or a giant sack of little jewels for some super-enormo cat burglar to come after....? Hugo and Campbell Awards were announced on Saturday. Congratulations, Connie! Click on the link above for a complete list of all winners (and nominees) in every category. Jack Trump held his lucky penny in-between his thumb and forefinger as the ship moved into the dock. There was a thick mist covering London and looking out, it could have been anywhere. It suited Jack to look the way it did. Having no-one, he had no home. He was as shiftless as the fog. As the boat drew in he arched his back, the uniform cutting into his shoulders, his ribs. No-one said being a war hero would leave such an itch, he thought sadly and settled back into the folds of the cloth. He looked around to the others, some of them straining their necks, searching for admirers, families, lovers. Jack almost felt sorry for them but not quite. We fought the war on foreign shores to be greeted with empty piers; he thought and shook his head. One of the others choked back a sob and Jack handed him a cigarette as a form of escape. “Obliged,” he muttered, as Jack cupped the light around his palm. “So much for the soldier’s return, huh?” he said mildly. Like the rest of them, he was young but with age etched over every place, the eyes and the brow. It looked as if an old ghost hovered over his face, superimposing itself over the boyish skin. But Jack knew the haunting visage would not be lifted or expelled, not now. The war had left more scars on the inside than out on most of them, himself included. “No-one who cared enough to put pen onto paper. I think I liked London better in my dreams,” he went on, blowing smoke in-between them. “I think I recall it looking much the same in my nightmares,” Jack said and was surprised to see the other man smile. It returned him to a young lad and it was both a fine sight and a terrible wonder to see. “Bill Bisbee,” he said, striking out a hand. Jack replied, accepting the grip. For a moment he wondered if the man had engineered this meeting. He knew of men in the trenches who went looking for others. It was an unspoken, barely accepted thing. Jack did not care for it but it did not trouble him either, the way it did others. “Work?” Bill went on, flicking the stub over the side. The men around them began to shuffle by, eager to walk into the mists, either to be found or stay hidden and lost. “I’ll look soon enough. I’m hoping the uniform might bring me something,” Jack said, joining the back of the queue. Bill nodded along, as if it was the answer he was expecting. “I’ll think on it,” Jack said, slowing enough to let the other man walk on. He tipped his cap and the other man smiled, mimicking the gesture; it was not spiteful but simply aware of the ridiculousness of it all. “For queen and country,” he said and clicked his heels, before slipping into the mist and the corner buildings. Jack watched him go and adjusted the ruck sack on his shoulder. He walked on, ignoring the cheap women and the commotion of the gin mills and stepped into the darkness. Jack found lodgings in the roughest part of town and paid the lowest prices. Though he was not poor, he was wary of running his commission down to nothing. He went without what was around him; the women, the booze, the poorly established card games that hovered on every corner. Instead, he busied himself with searching for work and keeping his fitness. On the hours he found himself idle he visited the libraries and bookshops and read the newspapers he could find. The news filled him with a slow, inevitable dread. Queen Victoria was in a constant show of mourning, her black veil drawn low on every occasion. It was as if her sadness pervaded the country, filling each face with a withdrawn, desperate sadness. It had reached the point where the society women wore imitation veils, ‘Widow’s Weeds,’ out of a mark of respect, or maybe in acknowledgement of the country’s desperate plight. Each day he ploughed on, walking to and from workplaces, never letting his shoulders sag. Each rejection peppered him but did not weaken his resolve; instead, he took interest in the way he was rejected, from the polite to the terse. Back he went to the papers and the crime. He noted a report of another murder, a second in as many days; the signs as gruesome and as mystifying as the first and a sure sign something was afoot. The penny began to burn in his palm, as he knew it eventually would. At last, he gave way to temptation and crossed the threshold of the last book keepers, with his question set firmly in his throat. “The occult,” he said simply and spoke of names. Jack watched as the salesman blanched. It was as he suspected; a combination of splutters and half-formed denials. “You either have the texts or you do not. I would hope you would not have a soldier stoop to searching back alleys for what ails him.” Jack’s voice did not waver; it had the desired effect, that was, to shame the man into reaching below the till. “I will trust in your discretion as a soldier then,” he said, almost bitterly. “As much as I will on your word as an Englishman for my privacy,” Jack replied immediately. Again the loathsome little man blanched before agreeing to their pact. Jack left the money on the counter, not prepared to touch the fat fingers that oozed sweat. In deference, he tipped his hat and made his way out before the squalid little scene could play out any longer. Jack lit the candle and sat as best he could on the broken bed. He drew open the book and began, a notebook by his side and a pen ready. The penny sat by the candle, as simple and as harmless looking as any other. The sound of the pages filled the small room, though Jack could only hear the dead man’s voice as he followed each word. To say he was scared was to state that Jack breathed, so natural was it in those first few weeks. Each of the new recruits was referred to as ‘fodder’ by the men, their life expectancy gambled in toothpicks and crudely drawn graphs in the mud. Twice bullets had whistled by his ear, close enough to singe the skin and the knowledge he had not died by a feather’s breadth pulsed through his mind for nights on end. In the third week he shot and killed a man and was stunned by the wash of blankness that rode over him, a shocking numbness that felt, more or less, simply like another layer of cold. Jack was aware in that time he was either becoming a soldier or already dead, though neither idea scared him as it would have done in days gone by. The man befriended him over night-watch. He was a senior man but did not lord it over the men. He had a calmness that drew others to him and a keen ear for names which meant even the fodder had someone to remind them of their own names when the panic and the fear blossomed to almost unbearable extremes. Over a course of a dozen midnights the man spoke to Jack, just enough to engage without overwhelming, to make him smile without being coarse. In such a manner, Jack found himself talking back, revealing secrets he had kept pinned close to his heart, sharing hopes that had seemed foolish to himself and watched as the man smiled but did not laugh. Jack marvelled at the friendship grew over the stacks of dead bodies; conversations begun and ended with bombs and bullets. It was another form of madness; he did not doubt it for a second, but a welcome one and something to give cause to live for. He found the man dying at the end of the day, in amongst the stacks of corpses. They had gone over the top hours before and Jack, along with the rest of them, had witnessed Hell. He walked the battlefield in a kind of daze, his ears ringing and his face flecked with blood, aware he was not dead but not being able to come to terms with being alive. He found the man amongst two bodies, their arms around him as if they were celebrating and drew Jack close. The dying man spoke in such a calm voice; Jack had to crouch close to hear him. When it was over, the man pressed the coin into his palm. He died as soon as it had left his fingertips and for a long while Jack felt the man’s life-heat on the coin, like breath. He understood the coin for what it was, both a worthless penny and a magical weapon. Whether the dead man or Jack himself was mad mattered not; what was important was that they believed. Jack finished the book by the end of the week. Each day he collected the papers and sighted the latest murder, marvelling at the lack of attention it was getting, and tearing out the article to lay alongside the others; five in five days. He returned to the necessary pages of the book, re-examining each word and connotation, biding his time and waiting for a sign. It came on the sixth day and the latest disappearance, located in the vicinity of Wapping, not far from the factories and the rough house bars. “I’m looking for Bill Bisbee,” he said to the closest worker, an old dog with tattoos crawling up and down both forearms. “You’ll be looking for the Penny Lickers,” he muttered, jagging his head down the far end of the street. Finished, he went back to his work. Jack thanked him quietly and went on his way. As he walked down the street, he saw the broken glass on the street shimmer like jewels in the dawn light and he wondered if anyone other than a soldier could see such beauty in such cheap and ugly sights. “A week, if that,” Jack said, smiling. He accepted a cigarette and the two of them watched the factory buzz around them. “Midnight until dawn,” Jack said, ignoring the implications. Bill nodded and pointed out to the floor. “It doesn’t need much explaining. Be here tonight.” They stepped to the door. Jack looked back to the man, who seemed hollowed but alert, like he was still on foreign shores. “You don’t work the late shift?” Jack said, listening to the bags as they whistled by. “I’m both,” he said and smiled joylessly, all signs of the boy gone for good from him now. Jack slept the day and dressed out in the evening. The clothes were rough and sturdy, with enough space to slip the book inside without any noticeable bulk. He smiled to himself, aware he was trying to smuggle in a book to a dead-end shift, while every other man there would be trying to slip in something inside a bottle. For a solid hour he looked to the wall, the articles pinned beside the makeshift map he had drawn up of the capital. The factory was perfect for the crime, central to all the scenes, a maze of back alleys and side streets. Finally, Jack drew breath and scooped the coin from his table, flipping it once for luck, before jamming it into his pocket. The routine was as lack-lustre as he’d hoped; as the night grew dark, men boozed, slept and tended to whatever was necessary in the laziest, most perfunctory way possible. Bill was nowhere to be found, although Jack had an idea if he opened the office door and looked on the floor he’d be in the right kind of spot. While they waited for the next batch to tumble in, Jack walked away, waving a cigarette box in the vaguest of ways for anyone who cared to look in his direction. Within seconds he slipped into the darkness and the thickening mists. He followed the streets, dismissing the whoring and the dice and trying to centre on other, sharper sounds; the skim-snap of heels being dragged across cobbles, the jangling chaos of cheap pearls hitting bricks. He plunged further into the fog, isolating shadows and dismissing them accordingly as the drunks, the rutting customers and the dope fiends. Something hovered on the fringes of things and then an acute shadow launched into the air, too arched to be intoxicated and too trim to be a bloated local. Another shape, prone and listless prickled on the edge of his sight and Jack tumbled into life. As he reached for it, he became aware of the woman’s perfume and another, ancient stench behind it. His fist reached through the haze and shucked the girl to the concrete. In the next moment he gripped the creature and dragged it closer, into the poorly lit beam of a streetlamp. It should have horrified him, what was in his hands but Jack Trump felt nothing. It was a monster, certainly, an un-worldly, godless thing, but no more than that. Since his days on the Hellish battlefields, other dimensions did not trouble him. Horror was man and any other sort of monster was something of an odd, welcome respite. The creature squirmed under his hands but put up no real fight. It was pathetic more than anything and as Jack began to recite the recantation, he had the feeling he was performing something of a kindness as well as a duty. Once a soldier, always a soldier, he thought bitterly. The spell finished, he removed the coin from his pocket and thrust it into the creature’s forehead. It burned briefly and then puffed with smoke, the death of the skin snuffing out its unnatural heat. The creature slumped to the ground; swiftly slipping into dust and then nothingness, until it was but ash under his fingertips. Jack reached over and steadied the girl, gently slapping her back into consciousness. Immediately she reached for him, his belt and he recoiled, sighing as his senses returned to the familiar squalor of the putrid streets of the capital. He set her down on the concrete and walked away, leaving her to the night and her next customer. Bill found him as they emptied the last delivery into the crates. He was bleary eyed but aware and patted Jack jovially on the shoulder. They talked for a few minutes and then went their separate ways. Jack felt his limbs ache from the work but did not regret it. His mind tingled with his memory of the night and he picked up a newspaper, aware his fingertips were buzzing from where he had pressed the coin down onto the misbegotten flesh. Around the corner he found a table and bought himself a fresh pot of coffee. As he unfolded the paper, he saw a mass of columns, reporting each crime, each murder. He sifted through each, grimly marvelling at the rate of such terrible excesses and isolating the stranger, more fiendish acts from common thuggery. As he poured his coffee he pushed the penny onto his knuckles and let it climb up and down his hand. It began to glow as Jack returned to a headline on the second page, an unspeakable death with no witness or clue. The penny burned as he read it over and over and satisfied, Jack Trump tore the article from the paper and folded it into his pocket. As in this Saturday night. Yes, tomorrow! Saturday, August 20, 2011! So tune in and root for your favorite authors! Here is another very nice source for some free spec. fiction reading. Science Fiction World is keeping up with the technological times with apps for your Apple products. 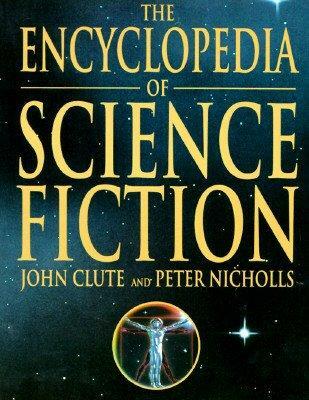 The Encyclopedia of Science Fiction, 3rd Ed. will be free online in 2012. 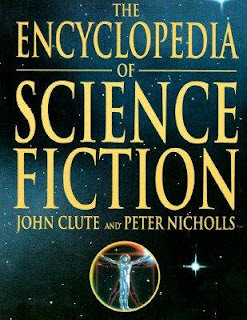 See article from Science Fiction World for more information. 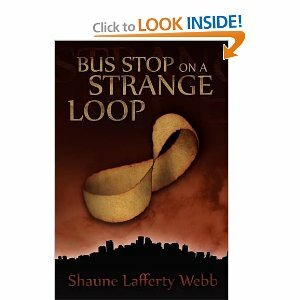 Just found out that a terrific former contributor to the Nautilus Engine, Shaune Lafferty Webb, has published her first novel, Bus Stop on a Strange Loop through Winterbourne Publishing. You may remember Shaune's wonderful story, "Memory Lane", about a very special item that makes its way back to a very unusual antique shop. If so, you know she has mad writing skills and this new work should be a page-turner! When brothers Nicky and Ethan escape the degraded, dangerous world of the future, they are seeking only sanctuary and peace. 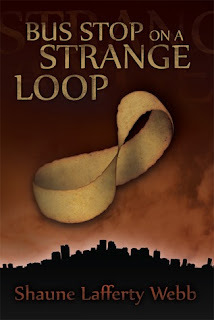 All they want is to leave their past behind them, but Ethan's unique talent, the instrument of their escape, means the past can never be forgotten - Nicky and Ethan have been followed... Schoolteacher Olivia lives a lonely but safe life in the home of her late foster parents, a home she is about to lose. After an unsettling encounter with her new neighbours and a series of puzzling break-ins, Olivia is inadvertently drawn into the brothers' lives, and her own past is brought into sharp relief by her discovery of a cache of her foster mother's diaries, which raise questions about her birth parents. The deeper she delves into the diaries, the closer she draws to unravelling an old mystery that will taint her relationship with Nicky and Ethan and challenge her perception of reality. As Olivia and the brothers are about to discover, sometimes paths intersect more than once. You can get your eager little paws on a copy several ways. Amazon has the trade paperback here or you can go the Kindle e-book route here. While you're on Amazon, you might as well go right ahead and read Shaune's bio. Further info on the book can be found over at the publisher's site. It is also available through B&N: trade or nook book and probably a few other vendors as well. When we've had a chance to hunker down in our comfy chair with it, we'll review it for you, but having read Shaune before, I trust it will be a real treat! The ultimate ex-patriot experience -- moving off the planet. Disinformation always has the most unusual stories. In the future you don't age past 25 and regular folk work to earn each extra day, hour, and minute (kind of like the present, isn't it?). Just a bit of a twist on a not-exactly-unique idea, but it looks exciting and I'm sure I'll be watching it. Here's the trailer for "In Time" due in theaters in October. Looks like this might not exactly be what Max Brooks (son of Mel Brooks, BTW) had in mind. That's a shame. A long and bloody trail had led him, by the autumn of 1890, from his home in Mississippi to the strange cities of the Far East. 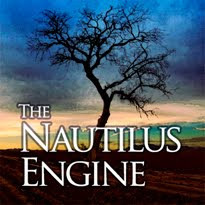 Over oceans and continents Grey Hawthorne came, all in pursuit of the man who had destroyed him. The man ran before Hawthorne like a beast before the hounds. “A week has passed since the man you seek left Shanghai,” said Hawthorne’s companion, Lin Sing. He sucked noisily on an English cigarette as he walked. “A week,” the Mississippian said. Hawthorne smiled, but it was empty and both of them knew it. They walked the Huahai Road, and the night air was pungent with sweat and animals and unwashed rice. On every corner, in every opening of every alleyway, street sharps called out for easy marks. Peasants from outside the city sold potatoes and onions from rickety carts. Pigs and chickens ran free, chased by small boys with sticks, and coolies ran at breakneck speed through the throngs, dragging rickshaws behind them. Colorful paper lanterns hung at regular intervals, casting flickering light, and over it all the constant noise of yelling, screaming, and the discordant music of plucked lute strings. But the dark kaleidoscope of Shanghai barely existed for Hawthorne at that moment. He was consumed by a black anticipation. A week. Only a week. It was early autumn. The Western world was encroaching on China bit by bit, sparking the Opium Wars and forcing free enterprise and missionary religion down the collective throat of the country. Rebellion was in the air, the outer provinces in total disarray, and new types of businessmen were already buying and selling in markets that didn’t exist twenty years earlier. Lin Sing was one of those businessmen. Despite his somber profession, Lin Sing looked downright festive. He wore a light blue suit—tailor-made, but not for him. It hung loose at the shoulders and cuffs, giving him a somewhat vaudevillian appearance. But, in the short time Hawthorne had known him, he’d learned that Sing was anything but comical. Lin Sing tossed his cigarette to the dirt, gazed with bemused interest at the throngs of people cascading through the open court of the Chenghuangmiao, the Town Temple God, where buying and selling reached a fever pitch. He stopped in front of a drab two-story building of wood and brick. The door hung open and he entered, pausing only long enough to say, “This way,” over his shoulder. Uneasily, Hawthorne followed. A corrupt stench, like rotting flesh, assailed his nostrils immediately. The room was dark and bare, the only light coming in through the open doorway. Immediately in front of them a rickety staircase led to the second floor. Lin Sing started up with a spry bounce, and Hawthorne followed him cautiously. He’d only met Sing two hours earlier, and painful experience had taught him always to expect the worst of men in his business. The top of the steps opened onto a low, broad room, brick-walled and plank-floored. A single kerosene lamp on the floor flicked dim orange tongues around the room, and radiated a heat that made Hawthorne sweat in his dark greatcoat. The stench of corruption was worse here, nearly overwhelming. At the far end of the room, partially obscured by shadows, a still figure in ragged robes sat in a plain wooden chair. The figure’s head was lowered, covered entirely by a broad-brimmed straw hat. Behind the unmoving form, another person stood, unmistakable even in the dim light as a woman. Lin Sing nodded shortly, and the woman stepped out of the shadows. The Mississippian glanced at Sing, and back at the woman. “The Nine?” he said. The still figure in the chair had not moved an inch or spoken since they’d entered the room. Mei touched the figure’s shoulder, said, “See, Mr. Hawthorne, what foulness the Nine spread.” She removed the straw hat and a cascade of silver hair spilled down over the figure’s ragged garb. Hawthorne hissed between his teeth and involuntarily stepped back. The rotting stench rolled across the room and the face turned up to meet the light like a blind, decayed flower, and the flickering orange light played across a blank, pale mask of flesh, as smooth and featureless as an egg shell. Where there should have been eyes, where there should have been a nose and mouth and some semblance of human features, there was only a smooth nothingness, like a painting with the features rubbed out. As he watched in horror, a fine fracture appeared where the woman’s forehead should have been—a crack as thin as a pencil line. The crack expanded, running down the blank face like a blood vessel or a drop of black rain down smooth glass. And something inside it pushed, expanded, with a weak mewling cry. Lin Sing said nothing, but his face mirrored the same horror Hawthorne felt. “It seems we have arrived just in time to witness this poor woman’s end,” he said. The old peasant woman remained motionless, as if already dead, and another crack appeared, along what should have been the jaw line. A pulpy, blood-smeared yolk leaked out, dripped thickly onto the tattered clothes. The crack broke open then, and something alive moved inside it. Lin Sing stepped up to the woman, pulling a small revolver out of his jacket pocket. He put the barrel against the shell of a head and pulled the trigger. In the shockwave of sound that echoed through the small room, the woman slumped out of her chair and fell to the floor. Her head cracked open entirely and Hawthorne cursed at the sight of the creature that had almost been born. A serpent, sinuous and green, with scaled wings like a bat, and a blood-red plume along its body. It flopped convulsively on the floor, writhing lethargically in its own fluids, and lay still. The next evening, a train rumbled out of Shanghai and into the Chinese countryside, leaving in its wake black smoke and the stink of hot iron. Grey Hawthorne had paid for a private compartment and did not object when Mei and Lin Sing joined him. He gazed out the window at the rushing night, but saw only his own reflection in the glass, hard and angular. He looked away from it. She looked as if she expected him to balk at the idea, but he only nodded and turned back to his reflection in the glass. With a quick gesture, he snapped the curtain shut, blocking out the night, and leaned forward on his cushioned bench. “Tell me about the Nine,” he said. Sitting next to Mei, Lin Sing lit a cigarette and shifted uncomfortably. The whistle bellowed, metal screeched and steel wheels chugged as the engine picked up more speed, plowing further and further into the unknown night, leaving behind everything real and becoming a part of something else. Hawthorne felt the muscles in his jaw tighten. Mei said, “When life is golden, one easily forgets how rapidly things can fall apart. This poor simpleton reached the bottom before he even knew he was falling. He took to drink, losing his business and his money and the respect of his peers. His children were forced out into the world to seek a living.” She smiled bitterly. “They died, each of them, from disease or violence or accident, and their father never saw them again. Hawthorne struggled for words, but the jumble of emotions that churned inside him was too great to be defined. His jaw ached and he realized he was grinding his teeth. Black spots danced before his eyes and he thought briefly of throttling the woman with his bare hands. But his upbringing asserted itself again, so deeply bred into him that the years of torment could not entirely dismantle it. One does not do harm upon a lady, he thought, under any circumstances whatsoever. And, with bitter irony, My father taught me that. A sharp sound at the outside window jerked him back, the sound of something thumping gently at the glass. They all tensed, eyes snapping to the curtain that covered the window. None of them moved for a long moment. And then another sound broke the silence of the compartment—a rasping noise, nails across glass, tapping. The weight of… something, shifting outside the train. “Stay back,” Hawthorne said. Mei and Lin did not argue. He took a step toward the curtain. The thing outside tapped again, very clearly, three times in slow succession. Hawthorne grasped the curtain in his hand and, steeling himself, snapped it back. A grinning, deathly white face pressed against the glass. Scraggly black hair whipped in the wind and eyes as black as tar stared soullessly. Hawthorne swore, jumping back to the far end of the compartment, and Sing and Mei scrambled noisily off the bench away from the window. Mei’s case fell with a muted thump to the floor. The thing clung to the side of the speeding train and pulled itself up higher. It was naked, rib bones protruding against its unnaturally white skin. Long, thin arms, a good foot longer than they should have been, made the creature look gangly and awkward, like a huge white spider. It pressed the fingers of one long hand against the window, and moved its mouth, yammering and howling, but the sounds it made were lost to the wind whipping past the train. Trembling, Sing tried to pull out his revolver, caught the hammer on the loose fabric of his coat. The thing’s fingertips pressed hard against the window, and the glass began to shimmer with emerald green light. Under each finger, it seemed to be melting, turning to thick liquid, and the light began forming distinct shapes—long, narrow, serpentine shapes, coming out of the creature’s fingers. Sing jerked the revolver free, ripping his lapel, and aimed at the window. He pulled the trigger and the glass exploded outward and the concussion of sound rang in Hawthorne’s ears so that he couldn’t hear anything for long seconds. The creature seemed unaffected, and he thought perhaps Sing had missed until he saw the bullet hole in the thing’s chest. The creature only grinned its horrible grin and clung there to the window frame. Sudden icy wind roared through the compartment, and the sinuous green light began taking a more solid shape, until Hawthorne fully realized what he was seeing—dragons, three of them, swimming ephemerally through the air, twisting like green smoke, crimson plumes wavering along their spines. Sing fired point-blank at one of them, but the bullet passed through the shimmering body as harmlessly as fingers through a pool of water. His face contorted by terror, Sing fired again and again as the dragon swam at him. Hawthorne started to come to Sing’s aid, when another of the ectoplasmic things, about the length of his forearm, shot at his head. He batted at it, ducking, and his hand passed right through the body. From far away, he heard Mei crying out, saw from the corner of his eye his two companions under attack. The closest dragon circled Hawthorne’s head like a shark, and he swung at it again and again, to no effect. And then the thing loomed before him, hissing, and shot directly at his face. Before the Mississippian knew what was happening, the shimmering serpent became solid and real and its diamond-shaped head was in his mouth and pushing hard into his throat. Gagging, Hawthorne gripped the dragon’s suddenly material body and struggled to pull it out. He stumbled back against the cushioned bench, fell to the floor, wrestling desperately. As he fell, he caught a glimpse of Mei darting with almost superhuman speed out of another dragon’s path, and then ducking as it came at her again. But then Mei and Lin Sing didn’t exist anymore, the pale man at the train window didn’t matter. There was only this vile serpent invading his body, pushing its way into his throat, suffocating him. For all its previous insubstantiality, the dragon was now as solid and muscular as a python. It was all Hawthorne could do to keep the thing from pushing farther into his throat, let alone pull it out. He rolled around on the floor, the pulse at his temples throbbing, lungs aching from lack of oxygen. He felt the dragon’s snout shift at the very back of his throat, felt his fingers, slick with sweat, slipping. And he felt the dragon move another half inch—not down his throat, but up, up, trying to push through his sinus cavity. It was trying to get to his brain. That horrible realization gave him renewed strength. He bit down hard on the scaly hide, tasted coppery blood. The dragon thrashed angrily and he clamped his fingers hard around it and pulled with every ounce of muscle he had. The dragon slipped out, less than an inch, but writhed angrily and pushed back in. Hawthorne pulled back, managing to dislodge it by another three inches, feeling the serpent’s head at his tonsils now. And then a form appeared before him, looming, and another pair of hands gripped the dragon by its plume. Mei. Her eyes wide with horror, blood from a wound on her forehead smearing her face, she braced her feet on either side of him and strained to pull the monster out. Blackness began creeping in around the edges of his vision, and he felt his own grip weakening. And then the dragon was out and air rushed into his lungs and he choked back vomit and struggled to breathe normally. Mei slung the hissing dragon out the window and fell back, exhausted, onto the bench. For a long moment, Hawthorne lay on the floor, bellowing air in and out of his lungs and fighting the nausea and dizziness that threatened to overcome him. There was only the sound of the rushing wind, filling the train compartment so completely that no other sound could exist. When he finally pulled himself up to his knees, steadying himself on the bench, he saw that Mei hadn’t moved, only sat there staring dumbly at the wall. The dragons were gone. The hideous pale man was no longer at the window. And Lin Sing lay motionless on the floor near the compartment door. Hawthorne scrambled over to him, quickly checked his pulse. It was steady and sure, but one look at Sing’s face told him that regardless of his beating heart Sing was as good as dead. His facial features were already mostly gone. The eyes and mouth had completely disappeared, and the nose was nothing but two thin slits in the center of an egg-like façade. Even as Hawthorne watched, the slits began shrinking away to nothing. Tears streamed down her face, but no emotion other than blank shock showed in her eyes. She stared emptily at the wall and began rocking back and forth. “I saw it,” she said again. Hawthorne stood up and the familiar rage coursed through his blood, rage at the injustice of what had happened to Lin Sing, the injustice of all the evils that had been perpetrated against him and all the evils that plagued the innocent all over the world, every minute of every day, since the dawn of time. There will be a reckoning. I swear it. She did, turning her face to the wall. Hawthorne stood over Lin Sing, aimed the revolver carefully, and shot Lin Sing in the face. They trudged silently across the dark, wet countryside, and cold rain fell around them like fat insects splattering on the ground. Hawthorne had lost his hat when they jumped from the moving train, and sustained a gash on his left forearm and some cuts on his knees, but was otherwise in one piece. Mei, even in her tight-fitting emerald dress, fared better—only the knuckles on one small hand were scraped. And, though startled by such cold efficiency in a female, Hawthorne saw the logic of it. Ten minutes later, as the train slowed down to round a bend past some low-lying meadow lands, the two of them were poised at the rear of the car. They jumped into the darkness, Mei still holding tight to her oddly-shaped case. The rain started as soon as they began walking. Hawthorne draped his now tattered coat around her shoulders and she accepted the kindness with barely a nod. He walked beside her in only shirtsleeves and vest, feeling rather naked. She would not let him carry her case. The sky above was wide and black as a demon’s mouth, and jagged streaks of lightning flashed in the far distance. Thunder rumbled the wet ground, and the air smelled of moist and decayed vegetation. They slogged through flooded rice paddies, water up to their ankles, occasional trees like ancient madmen standing sentry in the dark and rain. During the intermittent flashes of lightning, he could see the black outline of a forest, far in the distance, but the thunder that trembled the earth after each flash was like a switch, throwing the whole world once again into utter blackness. Mei started, the sound of his voice pulling her out of some dark reverie. “What?” she said. He studied her profile as she walked, rain plastering her jet black hair to her head and rolling down her temples and narrow jaw. Something hitched in his stomach, some sort of recognition, and he realized he was looking at someone just like him. Someone burning from the inside. They walked in silence, and before long the forest was before them. They entered it without pause and the thick trees canopied the rain off their heads and soon they were plunged into almost total blackness. “I have already told you of how, six months ago, the rains came and the gnarled roots of the Tree were exposed. Most of the villagers did not understand the significance of this, or of the nine cavities that surrounded the Tree. My great-grandmother understood, and I understood, but only a handful of others were willing to see it for the disaster that it was. “We searched the surrounding forests for signs of them, but found none. What would we do, anyway, if we found them? My great-grandmother poured over the legends, seeking a way to destroy the Nine—for we knew they would begin preying on us before long. And she was right. Three nights after the rains, the first victim was discovered, a young girl not more than twelve, sprawled out in the road in front of her home, her face already gone. Yet she still lived. How? She had no mouth or nose to breath, and yet her heart beat on, her chest rose and fell as if with breath. The village physician pronounced it the work of demons, and that was the first intelligent thing anyone had said about it. “You can imagine the reaction when, that very evening, the dragon in her head was birthed. It tore the throats out of three of her family members before they managed to kill it. “Finally, the rest of the village understood the peril it faced, and all eyes turned to my great-grandmother. “Of course his hate for his fellow villagers could not have been that overwhelming, or he would not have volunteered to face the Nine in our names. We overlooked that, and saw him off that evening as he trudged into the woods to seek them out, carrying a sword and a bow. “We found him three days later, at the Tree of the Moon. His head mangled, the dragon that had sprung from it long gone. Mei told the story matter-of-factly, not looking at Hawthorne, not slowing her pace through the woods. The rain had slacked off and the moon rose fat in the black sky, filtering gold light through the canopy of leaves and twisted branches. He said nothing. They walked. The Tree of the Moon was a gnarled old willow with leaves so dark they were almost black, and the branches drooped so dramatically that, in places, they brushed lethargically against the damp ground. The thick roots twisted up out of the dirt, as if the whole tree was in the midst of pushing itself up and away, to shamble off into the darkness. Nine mounds of dirt surrounded it, laid out in a symmetrical pattern. Silence reigned in the forest here, the air thick and cloying with a sort of corrupt dampness. It was a stage. A hidden theater, where the participants were the spectators and the grand finale ended with blood and suffering. Mei stopped at the edge of the clearing, set her case on the ground and opened it, revealing the fine, hand-made bow within. With something like reverence, she lifted it out and ran her delicate fingers over the polished wood. She nodded, and began stringing the bow. She considered for a moment before handing the weapon over. He examined it appreciatively, marveling at its perfect weight and dead-on balance. He’d spent a great deal of his boyhood bow-hunting in the woods surrounding the family estate, but he couldn’t recall ever seeing this bow’s equal. “The Nine are already here.” She swept a hand toward the mounds. He stepped into the clearing, nocking the arrow into the bow as he approached the grave-mound. His eyes moved constantly, watching the other mounds, the forest around them, alert for any movement or sign of impending attack. Fear was an emotion Grey Hawthorne knew and understood intimately, but his trials had immunized him against inaction and hesitation. This, however, was different. Not knowing the enemy, not certain of when or where inevitable attack would come from, was… unnerving. He stepped up to the fresh mound, gazed down at it. In his mind, je could see the horrible white creature beneath the dirt, burrowed like some vile grub worm, staring up at him through the soil with dead black eyes and lunatic grin. He pulled back the bowstring, took careful aim along the arrow’s shaft at the heart of the mound. He thought of Lin Sing, and Mei’s great-grandmother, and all the other victims of the Pale Men. He took a deep breath, and, releasing it, let fly the arrow. The arrow thunked deep into the soil. A horrid screech cut through the forest and two long white arms shot out of the dirt, fingers twisted in agony. Hawthorne leapt back just as the wet earth exploded upward and the Pale Man came out of his grave, face contorted in pain. The arrow lodged in its throat, and the thing clawed at it desperately, screeching and wailing. A low, plaintive moan which seemed to come from the trees themselves vibrated through the forest. Hawthorne took another step back from the mounds. The moan grew in volume and intensity, sweeping across the clearing, swaying the black leaves of the Tree of the Moon. It was like the sound of the earth itself, dying in slow agony. The dirt of the other mounds trembled. Before the words were out of his mouth, all eight mounds disintegrated, and eight white forms sat up slowly from their uneasy slumber, like pale sickly mushrooms. Dirt cascaded off narrow shoulders. As one unholy organism, the eight remaining Pale Men turned their black and hungry eyes to him. They were long of body, these creatures, white as rice paper, with narrow soulless faces and wild jet black hair. Their arms seemed almost twice as long as their legs, and where there should have been genitalia there was only wrinkled white flesh. They moved like gangly insects. Hawthorne felt Mei’s slim fingers trembling as she pressed an arrow into his hand. The Pale Men scrambled spider-like out of their graves, white skin streaked and glistening with mud. The one he had shot ceased his wailing and slumped dead in the dirt, but the others seemed unconcerned. They pushed themselves up on their long thin limbs, grinning their madman grins. Hawthorne nocked the second arrow, took aim at the nearest one, and fired. The arrow found its mark in the creature’s chest. The Pale Man’s scream echoed through the forest, and the moaning that reverberated through Hawthorne’s head hit a high pitch. The Pale Man fell back into his grave and was still. The others hesitated, but only for a moment. They did not look at their fallen comrade, but only started across the clearing on all fours, moving slowly toward Hawthorne, like the stealthy, patient predators they were. The moaning, he realized, came from them, from somewhere deep in their throats. It was a lustful, expectant sound. He backed up another step as they neared, and Mei handed him another arrow. “Quickly!” she hissed. His own hands were shaking now, belying the fear he’d so far managed to keep in check. One more shot, he realized. Only time for one more shot before they come howling down on us. He nocked the arrow, pulled back the string and fired, all in one fluid motion. The arrow thunked into the forehead of one of the Pale Men, who screeched in agony and flopped over backwards, and then the remaining creatures were wailing and jabbering and rushing at him. He caught a glimpse of the diaphanous green dragons swimming toward them, flowing from the fingertips of the Pale Men, before he bolted. The Pale Men themselves were right behind. He steered himself toward a giant oak tree, pulling the bowstring taut, and steeling his nerves he spun to face the enemy, slamming his back against the tree as a brace. The closest Pale Man was close indeed, less than ten paces behind, three or four floating dragons squirming in the air before it. It yammered in bloodthirsty expectation, launched itself at him like an enormous white bird of prey. Hawthorne aimed and released the bowstring. The arrow caught the creature high in the chest, dropping it like a stone at his feet. The dragons instantly evaporated. The other creatures, coming fast, howled and raged. They loped toward him on all fours like bony white apes, their dragons streaming before them. Hawthorne took to his heels. Five left, he thought grimly. We don’t stand a chance. Mei was not far ahead—despite his command she had slowed down to wait for him. Thank God for that at least, he thought. She pressed another arrow into his hand and he risked a backward glance. He could still hear them, moaning and wailing in the darkness, but, scanning quickly, he saw no sign of them. He wasn’t foolish enough to suppose they’d lost the Pale Men. They were somewhere, out there in the dark, and he was not comforted by the fact that he couldn’t spot them. From the corner of his eye he saw a flash of white, and then a tremendous force crashed into him from the left. He went down, wind knocked from his lungs, and the bow went skittering out of his hands. The Pale Man was on him, ripping at his throat with talon-like fingers, drooling black bile and screeching. A dragon shimmered, taking solid form, and dove at his face. Hawthorne clenched his teeth tightly, struggled to pull the Pale Man’s fingers from his throat. The dragon slammed hissing against his face, biting his lips and jaw with wicked fangs, smashing at his teeth, trying to break through. At the same time, the Pale Man clawed at him furiously, howling like a banshee. Hawthorne smashed his left fist into the Pale Man’s narrow nose, heard bone crunch, but the creature only grunted with irritation and focused its attack on getting Hawthorne’s jaw open. Hawthorne pried at the fingers jamming into his mouth, not daring to bite them for fear that, even with that small an opening, the dragon might work its way down his throat. He thrashed his head from side to side, was rewarded only with bites to his ear and above his eye. It was then he spotted the arrow where it had fallen in the dirt, barely an arm’s length away, and a wild hope rose in his brain. He slammed his fist again and again into the Pale Man’s face, ignoring the dragon that mauled at his jaw, and at last the vile white fingers slackened and the Pale Man roared in anger and frustration. Hawthorne reached blindly and felt the smooth polish of the arrow in his fingers. He gripped it like a knife and slammed the point home, right into the thing’s ear. The roaring ceased abruptly and the creature fell away, killed instantly. The dragon vanished. Hawthorne clamored shakily to his feet, wiping blood away from his eyes, wondering almost idly if the goddamned dragon was venomous. But before the thought could take concrete form, he realized that dying slowly from venom, more than likely, was the least of his concerns at present. The four remaining Pale Men stared at him, less than thirty feet away. They hunkered motionless under the canopy of trees, no longer howling, no longer grinning, only staring with their dead black eyes. Several shimmering dragons hovered in the air above them, floating like garish confetti. Was it… fear? Hawthorne didn’t know, but a profound change had taken place. He backed up one, two steps. He spotted the bow from the corner of his eye and picked it up. One of the creatures moved forward on hands and feet, and the others followed. Then another move forward, and another. Hawthorne turned and ran to catch up with Mei, and heard them shift behind him, giving chase again, but this time silently. A small clearing in the woods revealed a rocky ridge about twenty feet high, silhouetted against the night sky, and he saw Mei’s slender form atop it. “Hurry!” she said. He tossed her the bow, and she reached down a hand to help him up. Scurrying up the steep rocks without aid would have taken valuable minutes and he wondered how she’d been able to scale it herself without help. There was much more to this woman, he thought, than what met the eye. The ridge they stood upon was about ten feet around, and the far side of it dropped down even steeper than the front. A decent defensive position. The Pale Men crept forward, and Hawthorne slid an arrow into the bow, drew back the string and shot at them before they were three steps into the clearing. The arrow sliced into the dirt inches from the closest creature’s foot. He scowled, cursing himself for shooting too soon. “I know,” he said. The Pale Men approached with caution, glaring up at their prey. Hawthorne nocked another arrow, aimed carefully, and let it fly. This time his aim was truer—the arrow hit home solidly in the face of its target, and one more Pale Man dropped. The last three did not react, only crept forward with chilling single-mindedness, relentlessly, inevitably. Hawthorne nocked another arrow just as they gained the bottom of the ridge and started to climb up. The green and red glimmer of their dragons shot to and fro with maniacal energy. Gritting his teeth, Hawthorne aimed at the top of the nearest shaggy head and released the bowstring. He was close enough to hear the thing’s creaking moan as it fell back, dead, to the dirt below. He took another arrow from Mei. Only one more remained in her hand. One of the two remaining Pale Men cleared the top of the ridge, pulling its lanky white body over the edge, staring blankly. It reached out one cadaverous hand and gripped the leg of Hawthorne’s trousers. Hawthorne jerked away, kicked the creature in the face, and swung the bow around to aim. He released the arrow nearly point-blank, and it thudded so solidly into the thing’s face that the tip peeked out from the back of its skull. The Pale Man slumped backwards and tumbled down the rocky incline, its dragons dissipating like fog. Mei quickly shoved the last arrow into his hand and he nocked it, pulled back the bowstring to slay the final creature. He took a step toward the edge, peered down, all his senses keen for the kill now. The last Pale Man was nowhere to be seen. Hawthorne’s heart raced, and his eyes skipped over the bottom of the ridge. Nothing, only the still forms of the dead, sprawled out in the dirt. He stepped quickly to the other end, looked down the steep incline, saw nothing. “Where—“ he said, and Mei screamed. The last Pale Man dropped down from an overhanging tree, immediately in front of him, knocking the bow from hands. Hissing triumphantly, it wrapped its fingers around Hawthorne’s throat in a vise-like grip. No dragons this time, no shimmering monsters taking solid form to seed him, only the iron grip of the Pale Man’s hands, choking out his life. It lifted him off the ground by the neck, squeezing, and Hawthorne flailed and kicked his legs. He pried at the strong fingers, punched and kicked, but the creature’s grip only tightened. Black eyes burned with glee. White hands throttled him mercilessly, and Hawthorne knew he was going to die. His long journey would end here, in the middle of a dark forest in China, and his bloody purpose in life would be forfeit. He felt no fear at that moment. Only deep, dark disappointment. Hawthorne heard a sound, faintly through the pounding of blood in his head, a soft thwip—and the Pale Man’s face went blank. The grip around his throat slackened and he fell to his knees. The Pale Man, an arrow jutting obscenely from its neck, tottered on its feet. The black eyes focused briefly on him, and then it toppled over the side of the ridge. Mei still held the bow in shooting position, and her face was white with fear. Hawthorne stood up, rubbing his throat. As he watched, Mei slowly lowered the bow, took a deep breath. Tremors began to rack her body and she dropped the weapon and looked at him. They stood in silence for a long time. Drops of fresh rain spattered down on their heads from out of the dark sky, sporadically at first, and then with force, and they only stood there on the ridge until they were soaked to the bone. He glanced down at the bodies of the Pale Men, littering the base of the ridge like broken discarded dolls, and gazing again at Mei he nodded, nodded as if he understood her, as if he too had let fly the last of his rage on the tip of an arrowhead. The rain turned silver in the moonlight and Hawthorne turned his face away from it.